So this fine specimen of dinner is a creation of Alysha’s – and boy was it tasty! 2 cups brussels sprouts, washed and halved. 1. Preheat the oven to 350. In a large skillet, heat the coconut oil. Make sure it is very hot – you can do this by doing the water droplet test (a drop of water should sizzle in the oil!). While the coconut oil is heating, rub the seasoning on the top and bottom of chicken breasts. 2. Once oil is hot, place the chicken skin-side down in the oil. It should sizzle. Throw in the onions around the chicken. Let the chicken cook about 5-7 minute or until skin is browned and crispy. 3. Flip the chicken over and let the under side cook about 2-3 minutes, so the chicken no longer looks raw. 4. Move the chicken skin side up to an 8×8 baking dish. Put onions around the chicken. Leave stove ON. 6. 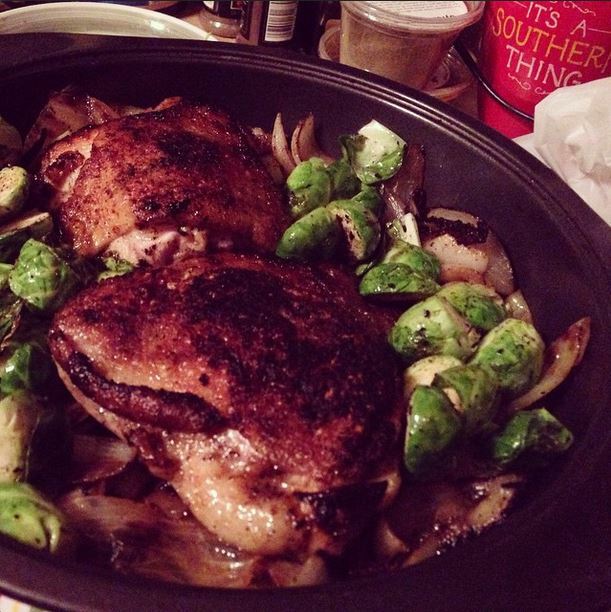 Put the sprouts in the 8×8 dish around the chicken. The chicken skin should not have vegetables on top or it will get soggy. 7. Put the baking dish in the oven and cook for 20 minutes. You can swap out the seasonings for ANYTHING you want, and make the chicken whatever flavor your heart desires! You can swap out the veggies! We did sprouts. We also did green beans. You could do just onions with the chicken for flavor, and then cook another veggie on the side or have a salad. the possibilities are endless! This can easily be scaled up for a family by adding more chicken thighs and more vegetables, or scaled down for one.. or you could make six at once and have leftovers! Reheats nicely in the oven! Super filling and UNDER 500 calories! 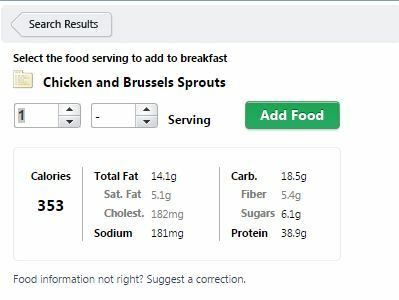 This assumes you eat 1 chicken thigh, half a cup of onions and 1 cup of brussels sprouts. This is gluten free, dairy free, and it can be paleo if you make sure to use a paleo friendly seasoning. this was also inexpensive! We bought a big pack of chicken thighs. If I scaled out the costs of all the ingredients, this was under $5 per person! In conclusion: healthy, tasty, easy, inexpensive, and able to modify for endless options. Sounds like the perfect dinner to me!